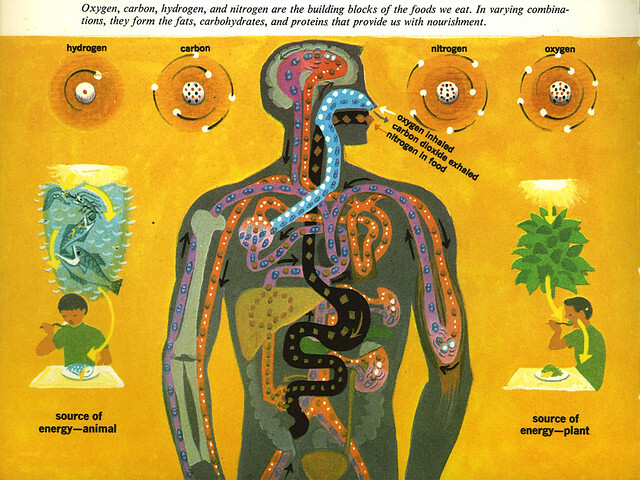 Found this incredibly colorful and wildly imaginative science book several years ago in a booth at an antique mall, I believe just outside of Chattanooga, TN. The place was a regular stop for Andrea and I whenever we'd take the trip up I-75 to Illinois to visit her parents. Sigh. Guess it'll be some time until we visit that place again. The booth I bought this book from was filled with wonderful old books, with a healthy section on textbooks and readers. Bought many a book from that seller. 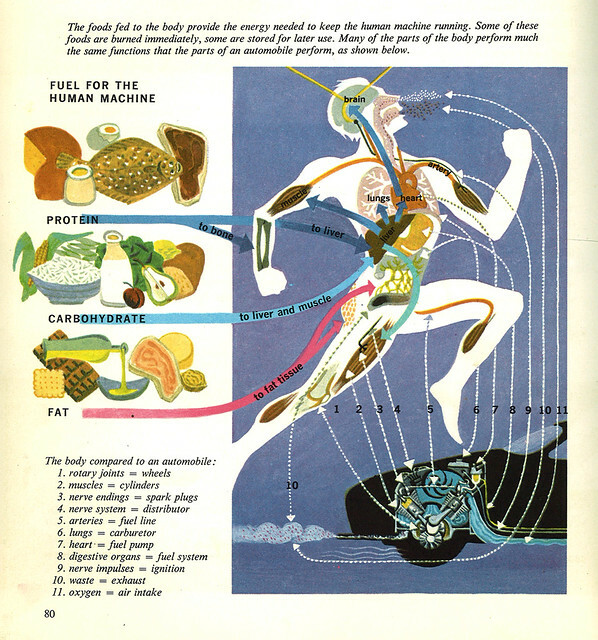 The nine systems of the human body. I put this image together from three different pages. Just got rid of the text. Looks nice to see all the illustrations together. Just look at how unafraid De Witt was with his use of color: purple with bright green. And it works somehow. What De Witt does perfectly is simplify the various organs and allows us to focus on what we need to look at without compromising the integrity of the subject matter. The colors clash, but not too much. Just enough to pique our interest. Definitely view this larger. There's some interesting things going on here. In the middle of the book, there's this fold-out that opens up into four pages. This is the entire spread. Brilliant. Just brilliant. View larger to fully appreciate the work. All of Cornelius De Witt's work on this book exemplified the notion of communication -- to take what the doctors and specialists were saying in the text and visualize in easy to read and understand images. 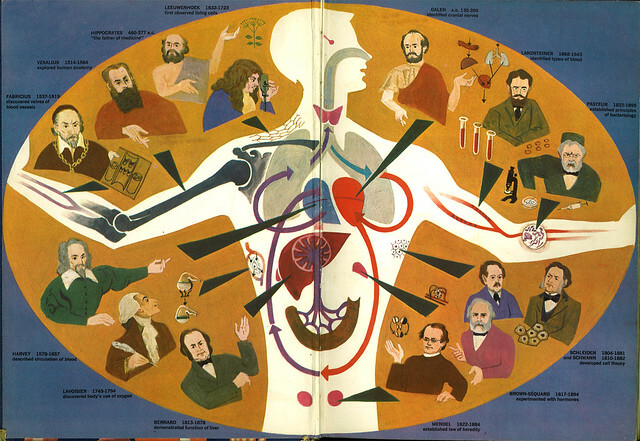 Because he was trying to make a mundane subject more intriguing, he experimented with color choices, often going far beyond the typical notion of what real organs and muscles should look like. Good thing the editors allowed De Witt to go to town with this project. 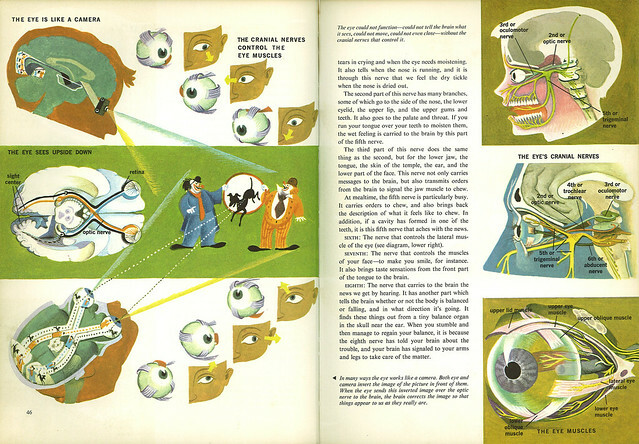 I doubt that any illustrator today would have the luxury of depicting the innards of the human body the way that De Witt does here in this book. There were so many pages to choose from, I couldn't possibly scan them all. If I have more time, I'll try and scan some more later on. Where in Chattanooga did you stop? I've driven through there a lot in the past two years. This is a major nostalgia trip for me....I had this book when I was a kid. (Actually, I'm pretty sure it originally belonged to my mom, since she was a teacher. My grandfather was also a surgeon, so maybe it belonged to him originally.) 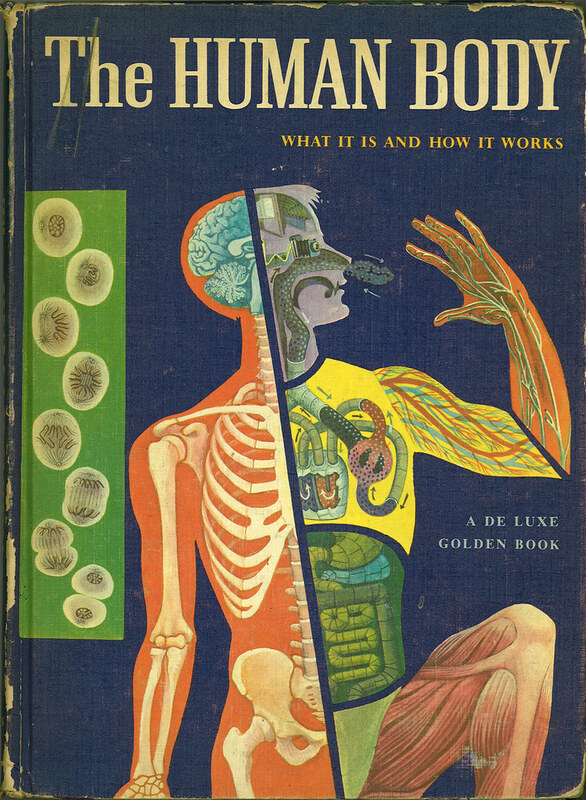 This book taught me everything I wanted to know about the human body as a child, along with those "Visible Man" (or Woman or Head) model kits. I always had a keen interest in science & nature. Thanks for posting this...it's really great to look back on. Brilliant find... I've never seen this book before. 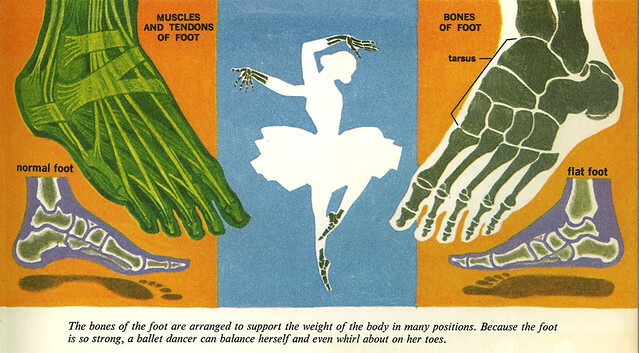 Particularly fine is the ballerina with skeletal hands and feet and the unashamed use of colour. 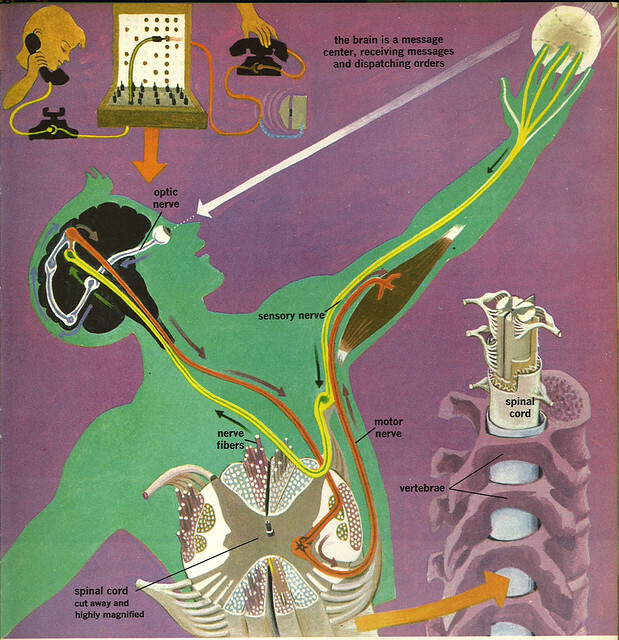 I too grew up with this book, and now it's doing time educating my anatomically curious daughter. 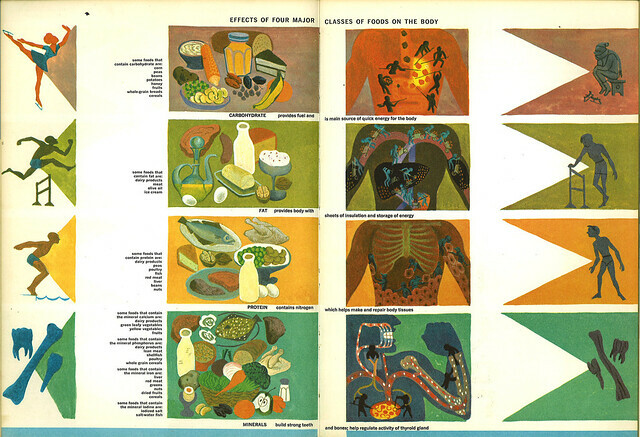 I especially liked the cell dividing sequence, the vitamin deficiency pictures and the fold-out. So, if LAIKA/House ever gets into educational videos, you know what to base it on! These drawings are so cool! When I was a kid I had one of those human body models with the plastic skeleton and the human organs that fit over it held together in a plastic case. I loved it because I was able to paint all of the parts. This reminds me of that gift so many years ago. thank you for sharing this fantastic book! my daughter is asking me things like, "what does my brain look like?" I just picked up a book by this artist and am gratified to see your blog on him....when are we going to meet him? Cause I'm going with you! I found my Golden History of the World in the most trashed out Goodwill here in Bakersfield CA and I am thrilled to own it. I thought I would be able to just jump online and find another (this one's binding is pretty beat up)but that didn't happen. So- there you go! Are you a cartoonist? I have been myself for many years but gave up the addiction when the rates fell!I am now a relic - ex-illustrator - ex-brushline inker - but happy to be now creating my own work. Did you hear what happened to Corney Cole? Cornelius was my grandfather. He is also known for his illustrations in the golden books series that so many of us read as kids.